Wayne Newton returns to the Las Vegas stage after a multi-year hiatus. Book your tickets online today to get the best deal on this iconic performer. After a five-year hiatus from performing, Wayne Newton returns to the stage with an all new original production. Known as Mr. Las Vegas, he has endeared audiences for over 5- years. The show features a compilation of all of Newton’s extraordinary talents. He sings crowd favorites and engages with the audience by answering questions. He plays a large variety of instruments and shares stories and videos collected during his 50+-year career. 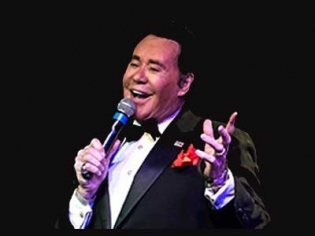 Known as Mr. Las Vegas, Wayne Newton has worked with everyone from the Rat Pack to The Killers. He is a natural performer who is embraced by the city as the epitome of entertainment. “I can’t tell you how thrilled I am to return home to the Las Vegas stage, especially to perform such a personal and unique show. This will be very different and a more intimate show than I’ve done in the past and I’m looking forward to interacting with each audience and sharing stories from my life in Las Vegas, some of which I’ve never told before,” Newton said.